Ella May Walker (1892-1960) was an Edmonton musician, artist, author and advocate for Edmonton’s history. She had a wide variety of interests and was very active in the local cultural life. She was also a working mother of two sons which was rare for her time. Ella was instrumental in shaping the City of Edmonton Archives as well as many other Edmonton cultural and heritage organizations. We chose Ella May Walker for our first virtual exhibit, not only because of the richness of her material we have at the Archives, but also to acknowledge and celebrate her role in our history. 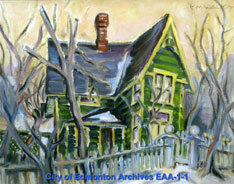 Ella May Walker, the artist, part of the City of Edmonton's Archives Online Exhibit. Ella May Walker, the Author, as part of the City of Edmonton's Archives Online Exhibit. Ella May Walker, the Legacy, as part of the Archives Online Exhibit. Ella May Walker was born Ella Jacoby in Minnesota in 1892. In 1920 she moved to Edmonton with her family. 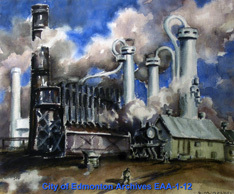 Every effort has been made to respect copyright for images used in the City of Edmonton Archives virtual exhibits. For more information please contact us at cms.archives@edmonton.ca or 780-496-8711.